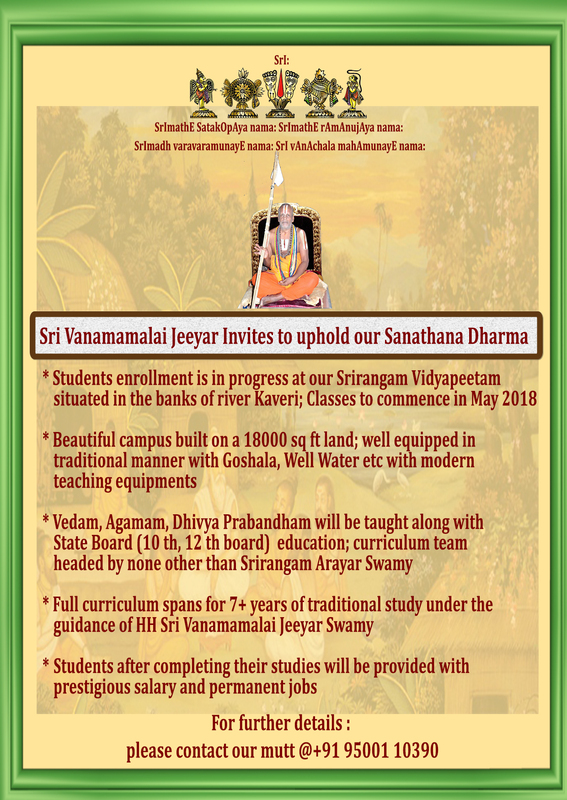 As you all may already be aware, Sri Vanamahachala VidyaPeetam is getting ready in Srirangam at a rapid pace. 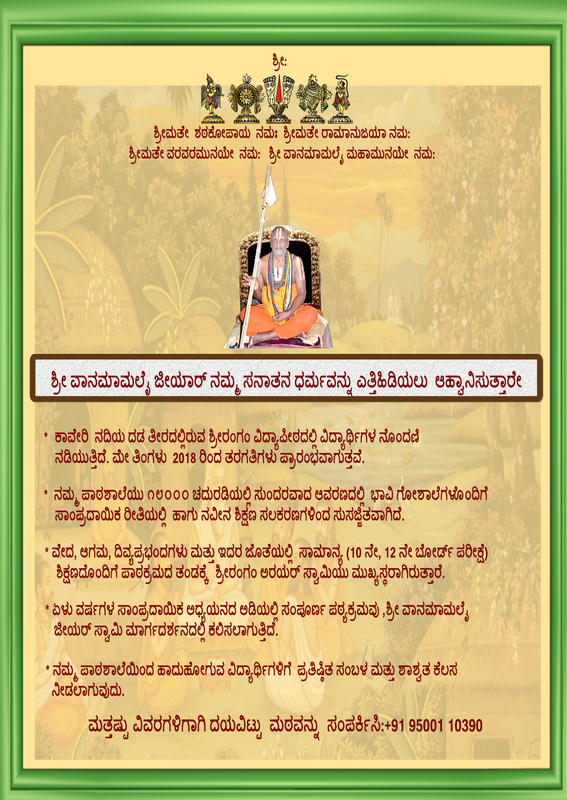 We have a couple of important announcements and an appeal for all our Bhagavatha bandhus. 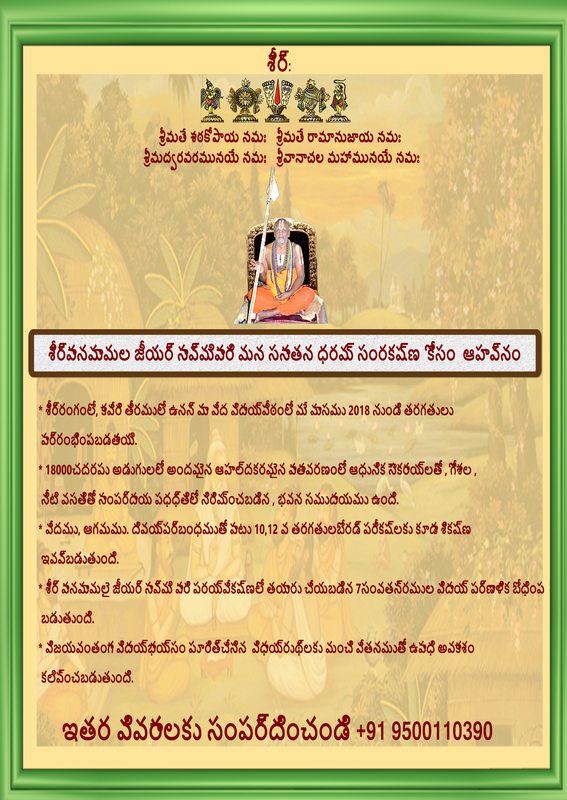 First, by the grace of Srivaramanga samedha Sri Vanamamalai Perumal, Azhwars and Acharyas, the grand inauguration ceremony for this integrated Patasala is scheduled to be on July 1st, 2018. 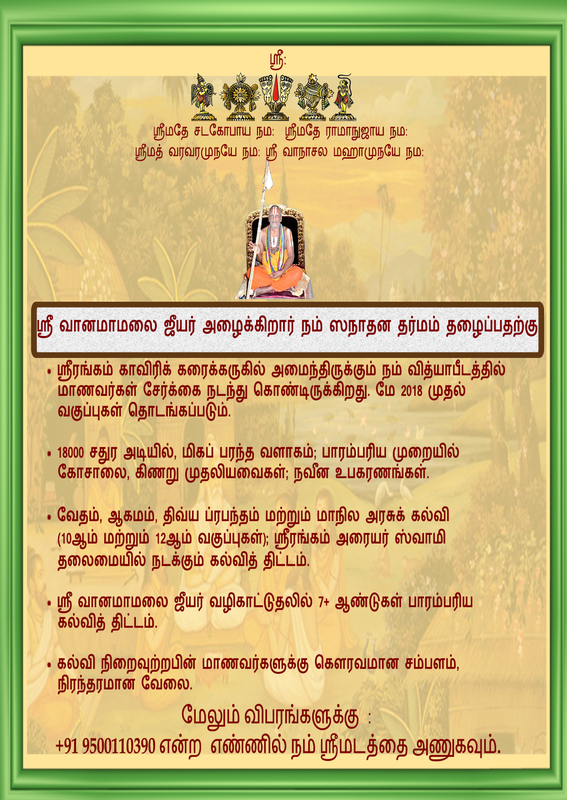 This will be presided over by Srimath Paramahamsa ithyadhi Madhurakavi Vanamamalai Ramanuja Jiyar, current and 31st Peetadhipadhi of Sri Vanamamalai/Thothadhri Mutt, and will be graced by many other Jeeyar swamys, Acharya purushas, Mahanths and Dignitaries. We are all eagerly awaiting for this event. Pictures of the opening ceremony can be viewed at https://www.facebook.com/koyil.org/posts/833344380201311 . Students enrollment is currently happening. We are expecting to have a reasonable number of students to be joining soon. Staffing is also in progress now. Also, those who are interested to donate to this noble cause, may contact us. Our Bank a/c details are listed below. Kindly keep us informed after sending your cheque or transferring funds, to let us send you the donation receipts. Your donations are tax-exempted under section 80G. Our postal address to send your cheques is - Sri. Sridhar Sowmyan, 143, North Uthira Street, Srirangam, Tiruchirapalli District - 620 006, Tamil Nadu .